Recycle! Write those 'Thank You' Notes! Recycle! Write those thank you notes! Do you still have all your Christmas wrapping supplies, rubber stamps, etc. all over the house? Before you put them away, why not make gift tags for next year? I was so happy that I took the time to make tags for this year at the end of last year. Wrapping up my gifts this year was a snap and I was proud to give gifts with handmade tags even if the gift was store-bought. I saved the prettiest wrappers and ribbons from my gifts to recycle into new tags. Now is the time to use up your leftover Christmas rub-ons and stickers. 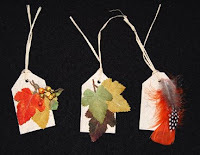 Usually I use tag shaped paper punches, but just cutting with decorative scissors will make your tags look special. 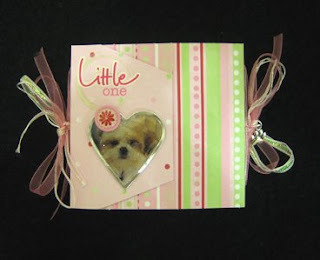 Sometimes gluing snippets of ribbons and glittery paper scraps are all you need to do to make one-of-a-kind tags or cards. This year I ended up with lots of ribbons that were just too short to wrap another gift, so I think I’ll turn them into book mark tags and give them with books next year. I hope that you’re getting started on sending written thank you notes….. e-mail thank yous are not good enough for someone who spent time and money to find you the perfect gift. I love the new Christmas line of 12 x12 papers and cardstock by My Mind’s Eye. They have a vintage distressed look and should make beautiful thank you note cards. 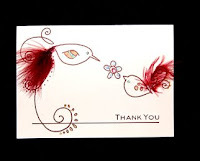 I think it is fine to use Christmas rubber stamps and embellishments on Christmas thank you notes. Even though you’re probably all Christmased out, I suggest taking advantage of all the after Christmas sales and make a few things for next year. 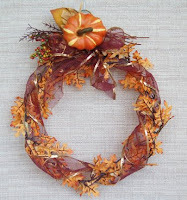 Don’t forget to buy craft supplies to make scrapbook pages of this year’s holiday season. In years to come, you’ll wish you had done more to preserve your memories. Now that the rain is here, it finally feels like we can wear sweaters and jackets and pretend that the precipitation is liquid snow. Today, I did a five-minute job of spray painting three Martha Stewart acorn ornament boxes. Design Master copper spray blended well with the chipboard color of the acorns, so I didn’t feel I needed to cover every inch of the acorn. I sprayed an overcoat of gold glitter Design Master paint and it added just the right touch of sparkle. As usual I did my spray painting in an extra large Ben Franklin Crafts plastic bag to minimize the mess and spread of fumes. To keep paint off the acorn hanging cord, I wrapped a piece of paper towel around the cord before spraying. Later I might add a plaid ribbon and red pips or jingle bells to further dress up the acorns. I think they are now the perfect place to hide some Christmas cash from Santa and I wish that I had purchased the pinecone boxes, too. There is only one "C" in Christmas! I think the ‘C’ in Christmas stands for crafting, not cooking or cleaning. (Cookie baking is a form of crafting so that’s allowed too.) I’m almost finished crafting everything I planned to make this year, except for two bracelets and an album. My Christmas cards will have to be Season’s Greetings again so I can include a family newsletter (not yet written) along with a New Year's wish. Happily, I was able to wrap up everything and get the packages mailed out before the post office’s recommended deadline. 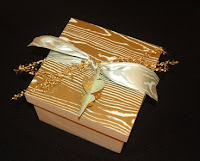 One of the gifts I am giving is fragile so I found a great wooden box (Sierra Pacific) at Ben Franklin Crafts. They have lots of shapes and sizes of good quality wooden boxes at very reasonable prices. Anyway, I liked the look of the unfinished wood surface and wanted to simply wrap it to let the wood grain show. Martha Stewart’s wood grain wrapping papers and ribbons gave me the idea to just paper the top of the box and tie the wide wood grain ribbon around it. (See photo. Click to enlarge.) By adding a few golden sprigs and a tag made from a Sizzix ornament die cutter, I think the wrapping is not only simple but elegant. Use double stick tape or sheet adhesive to adhere the paper to the top of the box. Spray adhesive also works, but don’t use a liquid glue as it will wrinkle the paper. 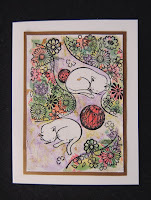 Now that I can emboss paper with stencils and the Big Shot, making cards is really easy. 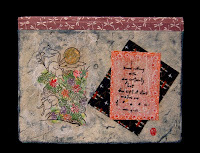 The cards photographed use two stencils from Dreamweaver, the poinsettia and one with four Hawaiian quilt squares. 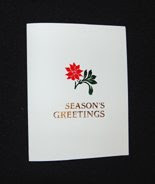 I found that by stamping a collage design (Hero Arts, Season’s Greetings collage) on white card stock first and then taping the poinsettia stencil over it (use removable tape), I could run it through the Big Shot to emboss. I chalked the poinsettia with red and gold powder before spraying it with a fixative. 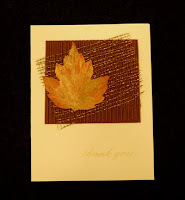 Then this embossed paper was taped to a dark green card and gold ink was lightly stamped around the edges. Both of these cards were quick to make because of the time saved not having to emboss by hand. If it’s too late for Christmas cards, you can use these techniques for New Year’s cards and thank you notes…. I just sent off some Hawaiian snowflakes (a.k.a. gingerbread snowflake cookies) to my sister. 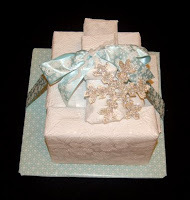 Originally, I had planned to just wrap her gifts in wrapping paper with a snowflake design, but then I found a beautiful wide turquoise satin ribbon (Martha Stewart) printed with white snowflakes. I especially like the quality of the Martha Stewart satin ribbons because they are so luscious that I only need to tie one big bow and the gift looks spectacular. Anyway, I wrapped the gifts in Martha Stewart snowflake paper and white embossed paper I already had. Next I simply tied everything together with the extra wide satin snowflake ribbon. For a tag I folded a thin white cardstock and put the fold along the top edge of the Sizzix snowflake ornament die cutter and rolled it into the Big Shot. By doing this, I made a large snowflake folded tag. 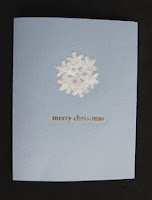 I glittered the front of the tag with silver glitter and tied it onto my snowflake package with fluffy white yarn. (see photo) There are several ornament die cutters by Sizzix, which fit into the Big Shot and make gorgeous paper ornaments. At 40% off I couldn’t resist buying several. You’d better hurry before they run out or go off sale. Oh, the giant Martha Stewart snowflake cookie cutters were on sale at Macy’s, but they may not have any left by now. I love Christmas sales! Bargains galore! Wow, where did November go? Time to put away the autumn leaves and take out the snowflakes. On Sunday I had 10 minutes to pop into the Mapunapuna BFC and was inspired by a Dreamweaver snowflake stencil. This silver metal stencil is the perfect size for a standard size card and has randomly spaced assorted snowflakes. By applying white embossing paste, (also by Dreamweaver), I was able to achieve a look similar to a fondant-covered cake with royal icing. Adding Martha Stewart white glitter to the paste snowflakes before they dried gave them just the right sugar like sparkle. I think the embossing paste doesn’t discolor the new, silver-colored stencils, so you can do multiple cards without washing the stencil in between cards. The card with the Happy Holidays ribbon (American Crafts) is a really simple card, which would make it ideal for multiple mailings. The tag and the other card were made because I smudged the paste snowflakes by not pulling the stencil straight up off the card. I didn’t want to discard the perfect snowflakes so I tore off the good parts. 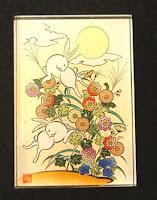 The Celebrate the Wonder rubber stamp is from Stampendous as is the clear stamp, winter wishes. Both were stamped on with Martha Stewart silver ink and embossed with Stampendous stardust transparent powder. 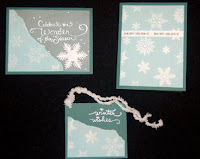 The plastic snowflake and vellum with sparkles were from my craft stash but should be easy to find at Ben Franklin. Oh, the light and fluffy snow-like yarn on the tag is Polarspun (Lion brand). I hope that you are having as much fun as I am, playing with my Christmas craft supplies. I know the season will speed by and I will soon have to put all the pine trees, snowmen, Santas, and snowflakes away for another year…so enjoy this time of crafting and giving. I realized yesterday that one of our nieces has a birthday coming up and I needed to make a card/gift fast. 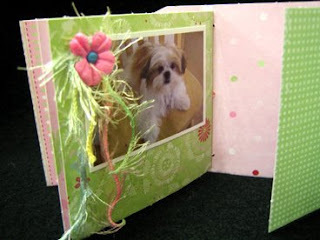 Looking around my craft room I spied a 12 x12 Deja-Views sheet that is cleverly designed to make a mini-album. I decided to make the album and decorate only the cover so that my niece would have the fun of embellishing the inside pages. By putting a jelly Happy Birthday sticker and a ‘14’ (her age) sticker (made by rubber stamping matching paper and running it through the Xyron machine), I made the mini-album into a birthday card. 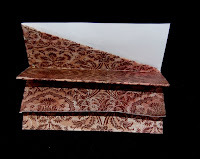 I added a vellum pocket for a cash gift and included embellishments (some came with the gatefold page). The gift/card was a success mostly because I was able to find a ribbon (Elements) and an ink color (Versa Magic, persimmon) that perfectly matched the colors of the Fresh Print Deja Views 12 x12 gatefold album paper. Having the right supplies means that you can make the right design choices for your project and that you have to shop often at Ben Franklin Crafts! We stayed home and kept it simple this year. The free-range turkey was tough, but the pie was great. Oh well, we stuffed ourselves anyway and there are lots of leftovers so I don’t have to cook for a while. Now onward to crafting….cards, ornaments, decorations, and gifts galore! In the coming weeks I’ll try to share my creations with you. Oh, the last time I shopped at Ben Franklin Crafts I found a bargain bin of bracelets at the Bead Shoppe. While the bracelets would be suitable for young girls, I purchased some to take apart for the cute charms. I think the little purses, butterflies, hearts, etc. 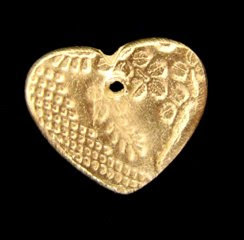 will make inexpensive embellishments for scrapbooks, purse pulls, bookmarks, and more. Also from the store I bought many new Sanrio products. Besides the perennial favorite design, Hello Kitty, there are many new characters, which are sure to please the little (or big) kids on your shopping list. A while ago I said I would show you the blank journal I made from a recycled marble tablet. (See photo.) The secret to coloring the intricate rubber stamp design is to stamp first on sheer white washi paper (with fibers or metallic inclusions). Use waterproof black ink or emboss with black detail powder. Glue colorful printed washi scraps to the back of the designs. Nori glue works well for pasting down the washi to almost any surface. As with any new project, test out your supplies for compatibility. 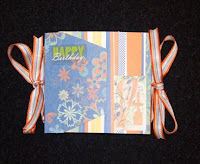 Using just one stamp you can make lots of handmade cards for gifts by just changing the color palette. The Martha Stewart winter/holiday items have arrived! I love the color palette, mostly pastel pink and aqua. I greedily bought ribbons, punches, wrapping paper, favor and ornament boxes, a card kit and more. There were many wide ribbons, which I really wanted but I settled for pink and aqua with copper foil designs and silver glittered designs. I plan to use them with plain white wrapping paper. The look would be suitable for other occasions as well. Even the pastel wrapping paper with copper designs was purchased for use other than Christmas gifts. 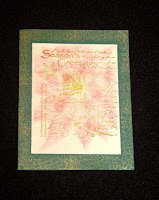 Particularly beautiful is the glittered branch card kit. This kit comes with four different card designs (3 of each) with matching envelopes. The designs are all evergreen branches done in a sunprint-style. The subtle designs are well suited for glittering. There are also four vials of glitter and a tube of glue included in the kit. I love the cards I made, and I plan to add a photo ornament to each card. Another adorable Martha Stewart holiday item is the acorn ornament box. There are actually two styles (the other one is a pinecone), which are made of pressed cardboard and designed to be painted and/or glittered. I am planning to decorate the boxes by gluing a mixture of brown flock and copper glitter to the surface. This way the boxes will look natural but with a touch of holiday sparkle. Filling the boxes with a surprise gift or cash will make them even more special. I also purchased the gingerbread favor boxes, cookie envelopes, and cupcake liners. The envelopes and liners I’m saving for Valentine goodies because they are red, white, and pink. I think I will add white dimensional paint and plastic candy or beads to the favor boxes to make them look more like candy houses before using them to house small gifts. Finally, I bought two paper punches (even though I wanted more), the dove and deer. I used them to make quick tags. (See photo.) Well, that’s it for today….I’ll write more about my purchases and projects later. Ah, it’s good to be home. Traveling to another country is always fun, but tiring. We did lots of shopping at bead shops, paper stores, and craft supply places. 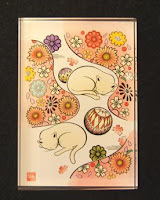 It has been about two years since I last visited Japan and I was anxious to see what the Japanese crafters were doing. They are usually in tune with European trends and a little behind U.S. crafts. Anyway, I was surprised that I didn’t see anything really new. I thought the Japanese would be doing more scrapbooking, but I didn’t see any evidence of it (although they did have lots of rubber stamps and punches for sale). In the bead stores, crystals still seem popular and there are some new shapes and colors. Perhaps because sterling silver prices have risen, other metal findings are visible. Of particular interest to me was the new ‘pink gold’. Available in chains, clasps, pins, etc. this new metal looks like a light-colored, shiny copper. I purchased a small quantity and hopefully will be able to offer findings to you on our store site. I think the pink gold is actually a copper alloy. It is a good alternative to gold or silver because it has a reasonable price tag. Japanese paper is still amazing to me. I think I am addicted to the textures and patterns. I had to refrain from buying all I wanted. I am thinking of making some mixed bags of various papers I’ve collected over the years and offering them on the website. The last time I was in Japan I found a place that sold mixed paper scraps in a bag and I thought they were a great deal. I think little bits of this and that are always fun for crafters. Many years ago I purchased a rubber stamp carving set at a craft fair and always wished that I had more rubber blanks. On this trip I discovered a small rubber stamp carving kit which we hope to put on sale on our website. I think Ben Franklin Crafts may have sold a larger set several years ago. I did find a project idea, which I plan to include in the next newsletter and I may have found a source for an item needed in another project. Overall, the trip was too short but it was good to visit Japan during the fall and see that Christmas is becoming a very big holiday for the Japanese. Hearing English Christmas carols in the Japanese shopping mall is somehow very odd but comforting. Okay, this is THE last Halloween entry for this year. 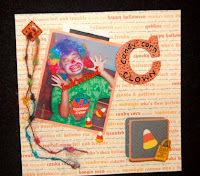 Of course, you can make scrapbook pages of Halloween all year long, but I need to get on with the other holidays. As you can see, I finished my pirate page. My inspiration came from the photos. Even though only one was of a pirate, I thought they both had a rough, tough boy look so I used a sword/dagger to link the photos. I wanted to use the Martha Stewart tag that had a skull and crossed bones, but I didn’t like the elastic cord on it so I removed it and used the tag for a handle and fastened it on with a brad. The spider webs in the upper corners were made from Martha Stewart adhesive ribbon tape with a little glitter glued on. The spider is one of her double adhesive stickers sprinkled with black and gold glitter. Another adhesive ribbon tape with the skulls is on the bottom of the page. The skull and sword are hand drawn and cut out. The candies are stickers. By not rushing the layout (I took several days to think it out), I believe I ended up with a good page. 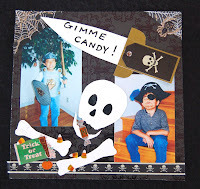 If you haven’t finished your Halloween pages (even ones from years ago), perhaps now is the time to get some of the Halloween papers and embellishments (some may even be on sale) before they are no longer available this year. Boo! Get scrapping!